We’d love your help. Let us know what’s wrong with this preview of Dr. Critchlore's School for Minions by Sheila Grau. Welcome to Dr. Critchlore’s School for Minions, the premier trainer of minions for Evil Overlords everywhere. No student is prouder to be at Dr. Critchlore’s than Runt Higgins, a twelve-year-old werewolf. (At least he thinks he’s twelve. He was abandoned at the school as a baby, so he can’t say for sure.) Runt loves everything about Dr. Critchlore’s. He loves his classes—l Welcome to Dr. Critchlore’s School for Minions, the premier trainer of minions for Evil Overlords everywhere. No student is prouder to be at Dr. Critchlore’s than Runt Higgins, a twelve-year-old werewolf. (At least he thinks he’s twelve. He was abandoned at the school as a baby, so he can’t say for sure.) Runt loves everything about Dr. Critchlore’s. He loves his classes—like History of Henchmen and Introduction to Explosives. He loves his friends—like Darthin the gargoyle and Syke the tree nymph. And he loves his foster family, who took him in when his wolf pack couldn’t. To ask other readers questions about Dr. Critchlore's School for Minions, please sign up. to all 14 winners of Dr. Critchlore's School for Minions i would like know if you got your book becuse i have not? Alysa H. I was a winner in the Feb 2015 giveaway. By April, I still hadn't received my copy so I sent a couple of private messages to Abrams Books (who ran the…moreI was a winner in the Feb 2015 giveaway. By April, I still hadn't received my copy so I sent a couple of private messages to Abrams Books (who ran the giveaway). They claimed to have tried sending it 2 times already, but asked me to verify my mailing address via email (not on Goodreads). I did that, and then quickly received my copy. This book is full of wacky, funny, gross-out fun AND an enormous amount of real heart, and I loved it. Runt Higgins is a non-morphing werewolf who was left as a baby at Dr. Critchlore's School for Minions for his own protection. Now - in hopes of finding his parents again - he's trying out for the elite Junior Henchman training program, with the help of his wonderful group of friends, including Frankie, a Frankenstein-style created boy whose head pops off when he gets too upset, Syke the hamadry This book is full of wacky, funny, gross-out fun AND an enormous amount of real heart, and I loved it. Runt Higgins is a non-morphing werewolf who was left as a baby at Dr. Critchlore's School for Minions for his own protection. Now - in hopes of finding his parents again - he's trying out for the elite Junior Henchman training program, with the help of his wonderful group of friends, including Frankie, a Frankenstein-style created boy whose head pops off when he gets too upset, Syke the hamadryad who can swing from tree to tree, and the crowd of sweet, shuffling zombies for whom Runt's become responsible. The characters are all fabulous and very funny. It's such a great mixture of fun and humor and genuinely creepy moments, and what carries it all through is Runt's true sweetness, his unstoppable optimism and his deep love for his created family. I enjoyed every minute of this book SO MUCH. I read it voraciously from the moment I got it, and then when I hit the ending this morning, I let out an actual (zombie-like!) moan of frustration because I didn't have Book 2 yet. Ok, quite the original plot we have here. Not only do we get mystery - yes, believe it or not, it was impossible to quess who really was the mastermind behind everything - but we also get the kind of main characters that we usually don't care for. The minions. One can love heroes and their sidekicks. One can sympathize with villains. But how often have we actually turned to look at a villain's minions, their faithful helpers and servants? So, yes, it was original and intriguing. The suspense was, though, the only thing that kept me turning the pages, because I was curious to see if I was right about the culprit - I wasn't, by the way. See, the book kept going on and on about Runt's daily school life - however unlucky it was - and while I do understand it was needed to make sure there were hints for us to fully grasp who was the real saboteur, it could still have been done in a way that would make it more... action-packed, I suppose. So I might be a sucker for middle grade books with supernatural elements in them. It started with Goosebumps for me, and as those were the books that taught me how to read, I will likely always have a place in my heart for books that feature monsters and kids and crazy situations. So when I saw this book I was instantly interested. It looked decent, and judging from the cover wasn't made up of solely white kids, so I picked it up and was not disappointed. Inside is a rather cute book about being who you are, about family and friendship and doing the right thing even when it means you can't have something that you really, really want. Also, it's rather ridiculous and cute and Runt is just a fun character. Heck, all the characters are fun and amusing and I will definitely keep reading this series if I can find the next books. There's a lot to recommend about this book, after all. The cast is rather interesting, featuring what might equate to the loser table in school. A Frankenstein's monster (or Frankenhammer, in this case), a mad scientist wannabee, a small ogre, a big human, and runt himself, to say nothing of Syke, Runt's adopted sister, and an annoying new kid who's hiding something. Then there are the teachers and staff and other students, all of whom stand out in different ways, but it's a vibrant cast that the author paints, full of neat twists. There's also some solid themes worked in most of the character development of being true to yourself, trusting your friends, and being open with your emotions. Also, one of the characters is secretly a merman and hides it because of how people view mermen and if that is not a veiled reference to homosexuality I don't know what is and so I like the book even more because of it. I might wanted to actually see non-straight characters be out and open, but that I could read (what I hope are) queer themes in the book made me happy. Then there's the plot, which is something of a mystery wrapped in the usual school story about the main character not fitting in anywhere and being picked on because he's small. And it's true that he doesn't seem to really belong at a school for minions, or even henchmen, because he's a nice person, but that's part of what seems to be going on, that the real job of henchmen is to curb some of the damage that evil overlords might otherwise inflict. And the mystery is good and layered, with most people not being quite what they seem to be. There are many things that get picked up and put back down only to be developed later, and the story keeps a lot of balls in the air at once as it juggles toward the ending, which is cute and clever and wraps things up nicely while still leaving room for further developments later. 1. When you started this series what were your initial thoughts? I was captured right away. It was something new and interesting. It was fun to read from page one and kept my interest the whole time. I was happy I had book two waiting for me to read right away! 2. What did you love best about this book? I loved meeting all the characters in the series. I liked that they were funny. When you think of monster this is what you would think of. They were so interesting and all added so much to the story. 3. Who would you recommend this book to? I would recommend this book to anyone who likes funny and creative books. I think it is a great read for kids who have always wanted to hang out with monsters. Hop in the book and enjoy all the adventures inside. A zany romp through minion school with a sweet main character. Runt may be (extremely) gullible, but he's also one of the nicest kids I've ever encountered in children's literature. Witches and wizards have their own schools. Heroes and sidekicks have their own schools. Shoot, even evil overlords have their own schools. Sheila Grau’s book, Dr. Critchlore’s School for Minions, finally evens the playing field for minions and henchmen (or is that henchpersons?). The story opens at the beginning of Runt Higgins’s third year at minion school and follows the standard genre formula of students negotiating the hazards of both boarding school and other students of varying motives. Despite the fairly typical plot progression, I found this book absolutely charming. Grau’s wit shines through every page from clever “quotes” at the beginning of each chapter (“Slow and steady wins the race, if you have minions to sabotage your opponent. – Ancient Minion Proverb”), to funny situations when different species of minions mix (multi-species food fight in the cafeteria! ), to silly things she forces on her characters (Runt has to take on training a class of zombie minions). Most of the humor is directed at the middle grade reader, but I would swear Ms. Grau put some stuff in there just to amuse the adults. For example, the school is built on four pillars: Discipline, Duty, Determination, and On-Time Delivery. Dr. Critchlore’s hard-core, business school mindset had me giggling more than once. The characters that populate Dr. Critchlore’s School for Minions are surprisingly multi-dimensional. I loved seeing the different sides of each of the characters. Runt is a super-sweet werewolf who hasn’t morphed since he was seven and keeps getting stuck in the human dorm. Frankie (27th in a line of Frankenstein-like creatures) has daddy issues and is prone to losing his head. Darthin is smart enough to be an evil overlord, but he prefers the less competitive lifestyle of a minion. For me, there were two negatives about this book. First, I wanted to see more about how the school interacts with the world at large. Is this fantasy world entirely run by competing evil overlords? What is the society and government of Stull (the country Dr. Critchlore's School for Minions is in) like? Second, I absolutely adore Runt and would gladly adopt him at any time which makes him seem a little too “nice” to want to work for an evil overlord. I kept waiting for him to have a moral crisis. I look forward to seeing these issues addressed in future books -- I will definitely be reading them. Bottom line: a delightfully fun read for middle grades. I am passing this one to my 10, 11 and 13 year-olds to read. They’re gonna love it! Runt Higgins knows that bad things happen in threes, unless you're cursed then bad things just keep happening over and over. Runt is pretty sure that he's cursed cause bad things just keep happening so far during his junior year at Dr. Critchlore's School for Minions. Bad thing #1 is that for the third year in a row he's been put into the wrong dormitory, the human dormitory, even though deep inside he's a vicious werewolf. The problem with being a vicious werewolf deep inside is that on the outside you do look, well, like a human so no one understands. Bad thing #2 is that there is a video getting a lot of attention about some recent graduates from Dr. Critchlore's School for Minions being scared off my some girl explorers. This is NOT good for the school or any of its students. Evil Overlords will not want to recruit minions from a school whose graduated minions are scared of little girl explorers. Bad #3 is Runt's group of first years he's supposed to help train are mindless. No seriously they're zombies. And the bad things just keep happening. To Runt. To Dr. Critchlore. To the school. Runt is certain that someone is trying to shut the school down. The question is who? And more importantly why? It's up to Runt and his friends to figure out what's going on and put an end to it before the school is destroyed. Dr. Critchlores School for Minions is a middle grade novel written by Sheila Grau and illustrated by Joe Sutphin. It is the first book in a new series. The main character is Runt, a werewolf stuck in the human minion dorm and with a habit of being a little too nice. In his efforts to be the best Junior henchman ever he uncovers a plot to sabotage his boarding school. Oh, did I forget to mention that he attends the world's finest training program for aspiring minions to Evil Overlords? There are Dr. Critchlores School for Minions is a middle grade novel written by Sheila Grau and illustrated by Joe Sutphin. It is the first book in a new series. The main character is Runt, a werewolf stuck in the human minion dorm and with a habit of being a little too nice. In his efforts to be the best Junior henchman ever he uncovers a plot to sabotage his boarding school. Oh, did I forget to mention that he attends the world's finest training program for aspiring minions to Evil Overlords? There are troublesome zombies, a friend that keeps losing his head, explosions, and a headmaster that is not at all himself, to keep Runt on his toes. I love a story with unexpected heroes. Runt is one of those heroes. In Dr. Critchlores School for Minions Runt is not exactly a stand out, except for the fact that he has lived there since he was seven and left behind by his family. He is a quick thinker and knows his way around the school better than anyone. The school is his home, and when a shocking video appears showing some of the schools toughest graduates running for little girls everything is on the line. Soon the sabotage escalates and Runt is trying to figure out who is behind it while trying desperately to excel. Friendship, thinking fast, and unexpected discoveries will keep readers engaged in this fast paced read. I think this is just the thing to get some reluctant readers eager to read the next book in the series. 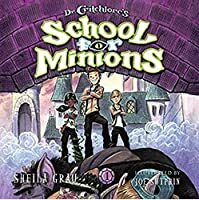 I just finished reading Dr. Critchlore's School for Minions, by Sheila Grau. I received an ARC of this book at the ALA Midwest Conference. I am so glad I got a copy of this book. It was definitely a fun read! Runt Higgins, the main character, is a third year minion-in-training at Dr. Critchlore's School for Minions. Creatures ranging from tiny Imps to gigantic Ogres attend this school in the hopes of becoming a minion someday for an Evil Overlord. The school year starts out rather Trouble Abounds! The school year starts out rather rocky, with the occurrence of several events that attempt to undermine the quality of the school. Someone appears to be sabotaging the place. Is it a student? A teacher? A spy? And what's up with Dr. Critchlore? Instead of leading the minions through these difficult times, he would rather sit in his office and watch soap operas! With the help of his friends, Runt works to save the school from disaster. Along the way he discovers some secrets about himself and the family he hopes to find one day. I really enjoyed this book. It was one that was difficult to put down. The good characters were endearing, and the bullies were ones you love to hate. Joe Sutphin's illustrations were perfect for this type of book, and served to help the reader connect with the story. There is one thing about this story that frustrated me a little. I realize that the author is wanting to develop this into a series, but I felt that at the end of the book, she left too many questions unanswered and without a 'tease' that lets the reader know that they will be uncovered later on in the series. This is especially true in regards to Runt's curse. Hopefully more will come to light in her next book. With great power comes the responsibility to have great minions. A funny story that was a lot less silly than it might have been, with a nice balance of humor, mystery, action, suspense, and character. With even a few touches of hard realism about interpersonal relationships and social advancement (A henchman is rewarded handsomely for letting his boss take credit for his work). Runt Higgins is a third year student at the preeminent boarding school for minions he's lived at since infancy. A werewo With great power comes the responsibility to have great minions. Runt Higgins is a third year student at the preeminent boarding school for minions he's lived at since infancy. A werewolf who has yet to find his beastly aspect, he hopes to eventually secure a good position with a top evil overlord, along with the ogres, dryads, goblins, pixies, mermaids, zombies, vampires, humans, and other species who are his classmates. Someone seems determined to sabotage the school, though, putting everyone's future in jeopardy. Runt is hoping to figure out which of his odd peers, teachers, or other school staff might be behind the attacks before it's too late. Think Harry Potter, but instead of being trained in the art of witchcraft the students are trained to become Minions, then add werewolves, mummies, zombies, a whole lot of other monsters, and a few humans to the mix. Wonderful story! Action, suspense, a couple of mysteries, sabotage, and some general mischief. My only issue with this book was that it wasn't written for an older group; if it had, more people, including adults would really enjoy this story! A fun, funny read filled with quirky, lovable characters. I adored Runt and all of his somewhat misfit friends, and enjoyed reading about the many problems Runt must overcome as he worries about finding his real family, turning into a werewolf, saving Dr. Critchlore and his school, and either outwitting or avoiding those out to foil his plans. An easy sell to any middle-grade reader! I'd been wanting to read this one for a while, so I was excited to get my hands on an ARC. It was as fun as I'd hoped! Sheila Grau didn't just create a magical school; she created a fantastically rich world. Runt, the main character, is super sweet. I loved reading his interpretations of things, especially his take on classic fairy tales and the lessons we should learn from them. So much fun! Dr. Critchlore's School for Minions is a ton of fun. It takes the school-for-magical-beings trope and spins it in a very funny way. The world building is excellent. The main character is very sympathetic, the plot twists will delight MG readers. I can't wait for more from Sheila Grau! We enter the School for Minions in Runt's 3rd year- he is a minion-in-training at the school that took him in as a toddler, abandoned at the door and raised by Cook as part of her family. Think of lands sort of like Pratchett- many kingdoms with their EOs (Evil Overlords) all needing their Igors. It's like that, but with MANY more options for minions and henchmen! In fact, Runt has been placed in the Henchman in Training program!! But, due to administrative issues, they will have to compete for t We enter the School for Minions in Runt's 3rd year- he is a minion-in-training at the school that took him in as a toddler, abandoned at the door and raised by Cook as part of her family. Think of lands sort of like Pratchett- many kingdoms with their EOs (Evil Overlords) all needing their Igors. It's like that, but with MANY more options for minions and henchmen! In fact, Runt has been placed in the Henchman in Training program!! But, due to administrative issues, they will have to compete for the 5 spots in three contests. An obvious counter to a world where everyone wants to be witches and wizards (thanks HP- #ravenclaw4lyf!) having a group dedicated to following instructions and doing the NOT right thing is fun and Runt- knowing everyone and everything abt the castle- is a fine host. I was kinda going along with the story, but by the end the author, Shelia Grau, really had her feet under her and she is running full speed by the time she reaches a very satisfying ending. She's going so fast, in fact, that the 2nd book happens SECONDS after the first! And given all the character building secrets that came out I'm happy to continue right on! A most excellent book! It has all sorts of creepy and sometimes gross stuff in it. There's werewolves, skeletons, zombies and lots of other minions to be. This book has lots of funny quirky parts too. For example, in order to get the zombies to follow directions, the main character must use a whiny voice. The illustrator's drawing style fits the story well. I must admit...shh don't tell anyone...that I bought the book because of the illustrations. I'll be checking out Joe Sutphin's other illustra A most excellent book! It has all sorts of creepy and sometimes gross stuff in it. There's werewolves, skeletons, zombies and lots of other minions to be. This book has lots of funny quirky parts too. For example, in order to get the zombies to follow directions, the main character must use a whiny voice. If I was younger, this would have gotten a higher rating. As it was, I'm an old gal reading a middle grade book. But it was delightful. Most of the way through the book I kept thinking "this is the only one I'll read in this series". Then the ending happened. And now I want to know what happens next. So I guess I'll keep on going...at some point. This was a really great book. I loved the theme of this book. The theme was about monsters. The book is mainly about how a boy named Runt Higgins goes on adventure to become a henchmen. Along the way he faces many challenges and gets in some trouble. This is definitely a good book and I think others would enjoy reading it. This was just what I was wanting: A fun quick read that also didn't have any annoying kid book plot shortcuts (such as plot points not making any logical sense). It was also very surprisingly witty. I wasn't expecting to get so many chuckles out of this. The main character is such a nice person to the point that sometimes it becomes hilarious. I'm definitely reading the next one in the series. but the main character was, odd. The supporting cast was worth the read though. Read this to my son... pretty good but well have i mentioned i hate cliffhangers? Entertaining, fun, and full of heart!! Review by T.R. : "It was good. It was kind of funny." There are lots of interesting things going on in this book. Don't confuse these minions with "Despicable Me" minions. Dr. Critchlore's School is for training up top-drawer henchmen for Evil Overlords, and so is filled with every kind of monster, ogre, creature and evil spawn you can imagine. Except, of course, they're all just cheerfully decent sorts who are following a non-traditional career path. With this kind of book, it seems to me, you have to touch a lot of bases. You have to create an interesting and convincing school environment. You have to come up with an engaging hero with a compelling backstory. You need solid sidekicks and a wide range of entertaining supporting characters. And you need a decent action/adventure/mystery plot to keep everything rolling along. This book scores high marks on all of that. If anything the book sometimes can feel almost too busy. Our hero, Runt, is an orphan with a mysterious past. It's pretty clear that this is intended to be a series so we only get bits and hints about his true identity as the story moves along. MILD SPOILER. The main angle is that it's not clear that Runt is a traditional hench-monster at all - he may be something else that will only be slowly revealed. The running joke is that Runt keeps being put in with human minions when he wants to be placed with monster minions. That said, Runt is a bright, resourceful and upbeat hero who is a fine leading character. The book is told from Runt's point of view, and he never wears out his welcome. Runt's best pals, (budding mad scientist, tree nymph, Frankenstein monster with anxiety issues), are carefully drawn and given a lot of room to have their own personalities. This is complemented by a full array of supporting characters - fellow students, teachers, visitors, staff and so on, which allows for lots of bits of business and incidental funny set pieces. Much attention has been paid to amusing details of school life and so the whole School of Minions setting feels substantial, (in a casually light-hearted fashion). The actual plot is all over the place, but the basic thrust is that there may be a saboteur in the school. Because this is the first book in a series there are lots of sub-plots and lots of characters who will probably reemerge as important down the road. There is a very satisfying and suspenseful big-action finish. So, this was much deeper and more carefully developed than I expected. (I expected more of just an antic school-daze comedy with a monster twist). That's fine by me. This is a fun world filled with interesting characters. It strikes me that this would be an easier read than Potter level books and a nice intro to the style for younger readers ready to move beyond chapter books. The illustrations, which are detailed and nicely done, are humorous and would help a reader follow the story, which is a nice touch. Dr. Critchlore’s School for Minions produces the best minions in the world and any good Evil Overlord wants the best minions he or she can get. Runt Higgins, a young werewolf left at the school as a baby by his family, loves his home; foster family; and friends. Runt has managed to get a place in the Junior Henchman Program and hopes one day to become a great henchman and find his missing pack. But then strange, explosive things begin to happen and it seems someone is out to destroy the school a Dr. Critchlore’s School for Minions produces the best minions in the world and any good Evil Overlord wants the best minions he or she can get. Runt Higgins, a young werewolf left at the school as a baby by his family, loves his home; foster family; and friends. Runt has managed to get a place in the Junior Henchman Program and hopes one day to become a great henchman and find his missing pack. But then strange, explosive things begin to happen and it seems someone is out to destroy the school and Dr. Critchlore himself. It’s up to Runt and his friends to save their beloved school! 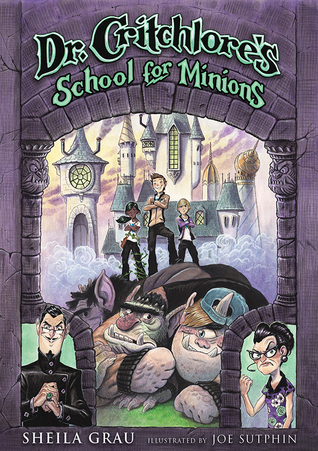 Sheila Grau’s Dr. Critchlore’s School for Minions is a wild and wacky romp of monster proportions! Like a sillier Harry Potter or lighter, more whimsical Addams Family, Dr. Critchlore’s School for Minions is pure fun. Grau has spun an unforgettable tale with oodles of imagination, delightful storytelling, and kid-friendly chills. The world of Dr. Critchlore’s is vividly laid out through captivating and creative world-building. From dastardly dungeons, spine-tingling laboratories, secret passageways, indoor oases, and more, Dr. Cricthlore’s is full of fantastical things, surprises around every corner, and endless amusements. And the world is inhabited by a plethora of beings and creatures- werewolves, ogres, nymphs, manticores, zombies, gargoyles, imps, sirens, merpeople, and more! From the zany to the deliciously frightening to the downright bizarre, Dr. Critchlore’s is home to it all. Young werewolf, Runt Higgins, is an endearing, likable character, as are his eclectic group of friends. And I love how over-the-top fun and oddball-ish the school’s teachers and staff are. Runt’s journey to save his beloved school and home is full of exciting action, intriguing mysteries, laugh-out-loud humor, and clever twists! And Joe Sutphin’s engaging illustrations awesomely bring the story to life.